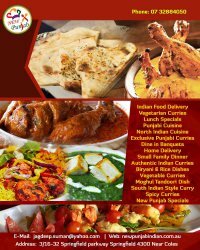 Order varieties of north Indian cuisine, authentic Indian & vegetarian curries from New Punjab Indian Restaurant located in Springfield. Enjoy our daily lunch specials menu with reasonable price. The cuisine of Punjab has a mammoth diversity of mouth-watering vegetarian as well as non vegetarian dishes. The seasoning content ranges from nominal to moderate to high. Punjabi food is usually appreciated by people of all regions. In Punjab, home cooking is different from the restaurant cooking style. At the restaurants, the chefs make a liberal use of desi ghee, butter and cream to make the food lip smacking and finger licking good. On the other hand, at home, people choose using sunflower oil or some other refined oil for cooking, with the basic thought of making the cooking low in fat content. Tuesday to Friday:- LUNCH: 11:30am to 02:00pm. DINNER: 05:00pm to :09:00pm.